Accepting to be part of someones wedding is a very beautiful thing. Each and every wedding is different, so if you’ve been in a bridal party before you should expect the experiences to be unique each and every time. The future bride to be can get creative with her bridal party invites and even personalize them a little to each bridesmaids liking. If you find yourself with a bridesmaid invite, really take a moment to appreciate all the effort that went into your unique and custom bridal party invite. Today’s weddings are a beautiful blend of traditions, reflecting what matters most to each couple. They are also more complicated than ever, with new customs replacing the old, new technologies to help plan and communicate, and new relations to consider as families grow more complex. But while weddings evolve, one thing remains constant, A wedding is one of the most special days in a persons life. Wedding attendants give help and support during the wedding preparations, serve as witnesses to the couples marriage, and as ambassadors and assistants at the wedding receptions. Including friends and loved ones in this happy milestone is one of the most cherished wedding customs. Our first brunch as a bridal party. We all got to meet new people and make new friends through out the planning process of this wedding and all the festivities that came along with the planning a wedding. Being a bridesmaid or groomsmen isn’t just about logistics; it’s about having a great time planning with your closets friends. Choose friends who are drama-free, flexible and upbeat. This isn’t a military campaign, after all it’s a wedding..
Shopping for a dress as a group was an absolute delight. We began shopping for my good friend who is now married as of this past July 2, 2017, back in December of last year. The setting could not have been more beautiful. It was in the beautiful bridal shops of downtown Denver, Colorado. The day was sunny with lots of snow, making each dress my friend tried on look like a fairy tale. If you are part of the bridal party but your significant other is not. It is important that his wedding attire still meets the wedding’s dress code. Hugo Boss is an excellent choice for men that are not part of the bridal party to select appropriate wedding attire for a male. A glass of bubbly is always a plus when you are shopping. If the wedding is semi formal this is probably the look you’d want to suggest to your significant other. Suit-style dark gray or black. The final look for us. His suit by Hugo Boss and my bridesmaid dress by Adrianna Papell. Participating in someone’s wedding is both a pleasure and a responsibility. An attendant should be a person you can count on to stay in touch in the weeks and months preceding the wedding, to follow up on requests without being reminded, to listen to instructions on the big day, and to be on time and ready for all events. Expenses for the attendants can add up quickly, from travel to clothing to participation in parties and showers. The number of pre-wedding events requiring a financial contribution or gift seems to be on the rise-such as engagement parties, showers, and bachelor and bachelorette parties-and this can be a source of economic strain for some attendants. It’s important to keep in mind all of your attendants aware that they can easily decline from attending any event they don’t feel comfortable attending. If you are in are mid 20’s or 30’s which is the age you’ll notice your friends typically start getting married or have babies and put together elaborate wedding receptions and baby showers. Everyone’s financial expenses are different. If you feel being part of a friends or family members wedding is going to put a dent in your dent in your wallet. You may be cordial and kindly decline. If the bride is a good friend she’ll understand and would still love for you to attend her wedding as a guest. The fabulous Bachelorette final festivities as a single woman took place in south beach, Miami Florida. Such a fun and fabulous time we all made arrangements to stay at the swanky Delano Hotel. The bridesmaid and the bride to be, enjoyed a beautiful dinner at the beautiful Villa Azur in Miami. There is no required number of attendants. The average is four to six bridesmaids and similar number of groomsmen or ushers, but you can include as many or as few as you like.. Some couples have a large number of attendants, but even a formal wedding with just one or two attendants on each side is perfectly fine. The more the merrier or sometimes you run the risk of some of the girls in your bridal party wont get along. It’s best to keep it under 7 or 6 girls. All the bridesmaid had a blast getting to know each other by all attending the girls trip in Miami. We did a little bit of boating, lounging by the pool and fancy dinners to wind down after the day activities under the sun. We all enjoyed a private cabana by the pool while staying at The Delano. A wonderful way to spend a summer day by the pool. The girls had a superb time lodging at The Delano Hotel in South Beach Miami. The amenities were all of top service and the food was delicious. The concierge had tons of options to choose from as on where to dine or have fun under the sun. 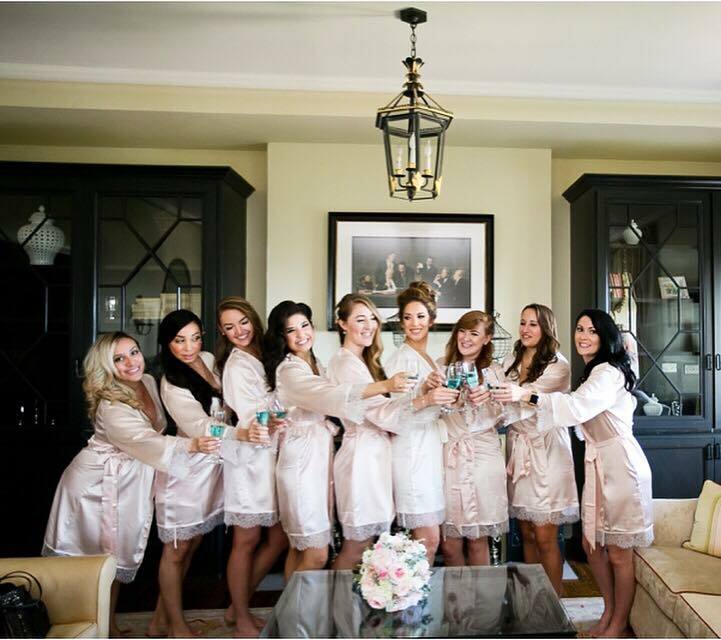 The Delano Hotel is definitely a fun place for you and your bridal party to make a weekend out of. I absolutely LOVED All the dresses by Adrianna Papell. They were all so comfortable and elegant. You can have pregnant bridesmaids? It’s fine to ask a friend who is pregnant to be a bridesmaid. Just be considerate of her needs and capabilities, and make exceptions to bridesmaid attire or shoes when appropriate. You may want to have a chair placed nearby so that the mother to be can sit during a lengthy service; to excuse her from a formal receiving line; and to make sure that she doesn’t go too long without eating or drinking at the reception. It was a real special moment reciting a poem at my beautiful friends ceremony. The Black Stone hotel is truly a breath taking venue. For questions, comments and booking inquires, Please take a moment and fill out our contact form below.